Huntly Writers launched their first anthology following at Duff House during Wordfringe 2008. It is a collection of poems and short stories in Doric and English. Full of humour, joy and sadness too it records the thoughts and feelings of the authors who live and work along the Deveron. During the evening they performed selected pieces from the anthology in their usual innovative and lively fashion, joined by guests Leán Coetzer (dancer) and Emily White (trombone). 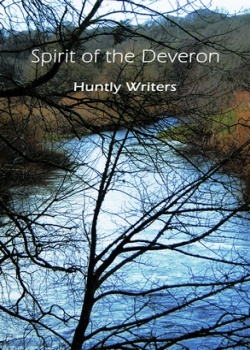 Duff House at Banff was the beautiful setting for the launch of the Huntly Writers anthology Spirit of the Deveron. With work ranging from the formal and traditional to wry, humorous post modern experimentation, this is a collection packed full of interest and originality. Huntly Writers were mindful of presentation, and incorporated music, dance and instantaneous video into the launch show, adding multimedia depth to the authors' vivid, entertaining readings. There is a strong Doric presence in this anthology from Linda Smith, Phyllis Goodall and Margaret Grant, balanced with a history from Anne Forbes of the Forbes/Gordon feuds at the time of Mary Queen of Scots, and the title of Chris Andrews' Hip-Hop Hymns brings us intriguingly bang up to date. Brian King incorporated Emily White and her trombone into his poem, and as well as reading his own work, poet Haworth Hodgkinson provided haunting music to a reading of Messenger by Maureen Ross whose white clothes served as a living screen for dancer Leán Coetzer's simultaneously danced and videoed interpretation of the poem. A memorable Wordfringe 2008 evening from Huntly Writers.